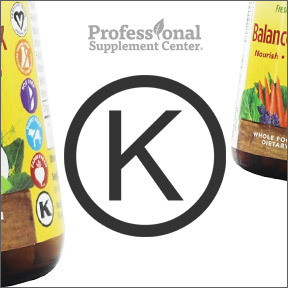 With Passover right around the corner, those keeping kosher may not be aware that Professional Supplement Center carries many high quality brands that manufacture kosher-certified supplements. For some, the laws of kashrut, Jewish dietary restrictions, are observed not only during Passover but are strictly followed year round. In regard to supplementation, these dietary laws stipulate that those in good health, who take vitamins or supplements for prevention purposes or to support their overall wellness, should preferably take kosher-certified products when available. In short, kosher certification identifies products that are proper for consumption under strict kashrut guidelines. Kosher certification is provided by a third-party certifying Jewish agency. A representative of that agency thoroughly inspects every aspect of the manufacturing facility and processes, including the sourcing of raw materials, ingredient adherence to Kosher guidelines and the final finished products. Depending on the product, Rabbinical supervision ensures that the finished product is compliant with kosher laws. Kosher certification ensures that no ineligible ingredients are utilized, such as those derived from shellfish. While there are additional restrictions for the observant during Passover, Jews and non-Jews alike are partial to kosher-certified supplements for their purity, quality, safety and strict manufacturing compliance. MegaFood® – MegaFood® sources whole foods from organic and sustainable farmers and tests all foods and ingredients throughout the manufacturing process to ensure optimal purity and nutrient content. All of their formulas are vegetarian, herbicide and pesticide free, and Non-GMO. Many are certified-kosher by OK Kosher Certification, a recognized global leader for kosher standards and integrity, assuring the processes and systems are compliant with the highest standards and regulations. 20% OFF All MegaFood products! Solgar® – Solgar® has manufactured fine quality, well-researched, science-based nutritional supplements for over 60 years. From their state-of-the-art manufacturing processes, high quality control standards, on-site stringent testing, to their air and water purification systems, Solgar® sets the standards for excellence in manufacturing to provide consumers with the highest quality nutritional products to promote optimal health. Products are certified kosher by KOF-K Kosher Supervision, a highly respected international organization. Organic India™ – Organic India™ believes that true and total wellness is more than just a lack of illness; it’s about “vibrancy, purpose, harmony, health and happiness,” and consciously choosing to take responsibility for your own true wellness. Their entire line of exceptional quality products is Fairtrade, certified organic, Non-GMO Project Verified and kosher-certified. From seed to sowing, from cultivation to harvesting, from processing to production, Organic India™ is committed to integrity, accountability and responsibility to Holistic Quality Assurance and complete mind, body and spirt wellness. Enzymedica – Since 1998, Enzymedica has designed and manufactured high potency, pure and effective enzyme supplements formulated for targeted support for common digestive discomforts, food intolerances, proper immune functions and healthy inflammatory responses. All of their formulas are 100% vegetarian, Non-GMO and many utilize vegan and certified-kosher ingredients. This entry was posted in Home and tagged Kosher certification, Kosher Supplements, MegaFood, Now Foods, Organic India, Professional Supplement Center, Vitamins and supplements, www.professionalsupplementcenter.com, You Don’t Have to be Jewish to Like Kosher Supplements. Bookmark the permalink.